The most effective way to insulate your commercial space and reduce your HVAC or utility bills is through spray foam insulation, a form of weatherization, on the interior and/or exterior of your building. However, while insulating the interior of your building can address a great deal of your energy loss, in the form of heated or cooled air, it’s not nearly as efficient as combining interior spray foam insulation with a spray polyurethane foam (SPF) roof. How well does an SPF roof insulate? Many of our customers have seen energy savings of up to 30% after purchasing an SPF roof. And that’s just with the roof alone, with no weatherization for the rest of the building. For any commercial building, your roof is the largest source of energy loss. This makes sense when you think about it — in the winter, your heat is trying to escape through your roof. In the summer, you need a sealed building envelope to keep your cold air in and your hot air out — and that air still wants to escape and enter through the roof. 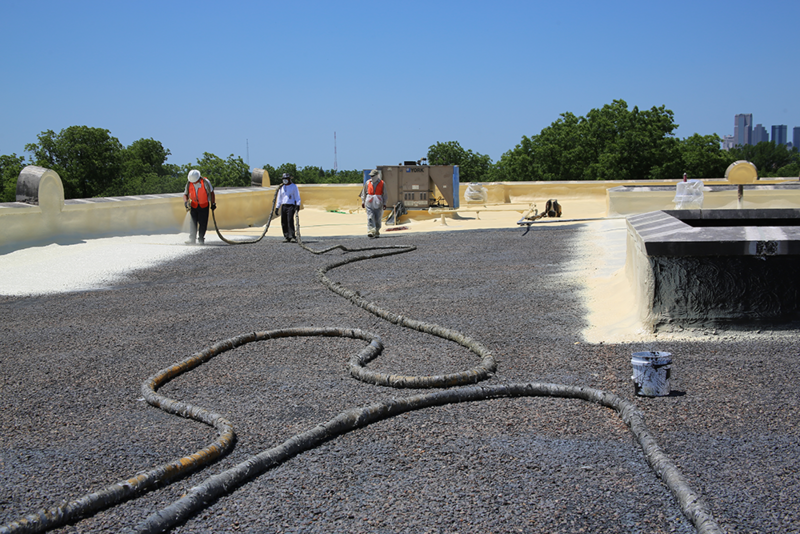 While insulating other key areas of your building is crucial to creating a strong building envelope (the physical separator between the interior and the exterior of your building), your roof should always be the main focus when it comes to insulation. When it comes time to insulate a commercial building, it’s not uncommon for the building owners to focus on insulating inside the building, forgetting about the exterior. Even when it’s clear that the roof needs to be insulated, they don’t consider protecting the outside of the building. They don’t see the roof as the problem — adding insulation to the interior of the building should be sufficient, right? Though you can certainly use spray foam insulation on the interior of your building and not alter your existing roof, you’re not addressing some very serious problems — your roof itself still contains seams and gaps, and it still absorbs way too much heat from the sun. These problems are simply impossible to eliminate with traditional roofing materials like steel. You can’t improve steel to make it cooler in the summer or completely seamless, but you can add SPF to a steel roof to accomplish these goals. 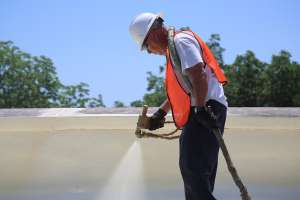 Because we can generally spray SPF directly onto your existing roof, you often don’t have to tear down your existing roof and start fresh — instead, we make your existing roof stronger, leak proof, reflective, renewable, and insulative. An SPF roof has a variety of other advantages as well, and can even protect against hail damage up to 1.75″ with certain roofing systems. Because of its unique application process, spray polyurethane foam eliminates seams, gaps, or even holes in your roof. This can be especially important in a roof with lots of penetrations, like pipes or AC units. Traditional roofing materials leave gaps around these penetrations — there’s really no way to avoid it with traditional materials. With SPF, we can fill every tiny gap, every minuscule hole, ensuring not only that your roof is seamless (and therefore leak proof), but also that no air can escape, or get in through, tiny seams or gaps in your roof. We can certainly add spray foam insulation to the interior of your existing building, and we are happy to do so — weatherization is the only way to ensure that we insulate as much of your building as possible — but interior insulation does nothing to reduce the heat from the sun. Traditional roofing materials can get extremely hot, especially here in Texas, or anywhere in the Sun Belt. Depending on what traditional material your roof is made of, a 90-degree day could lead to a surface temperature of 200 degrees or more. When your roof is that hot, the difficulty of cooling your building, and even simply keeping that incredible exterior heat out, is increased exponentially. Interior spray foam insulation alone won’t completely address this problem. But an SPF roofing system can. 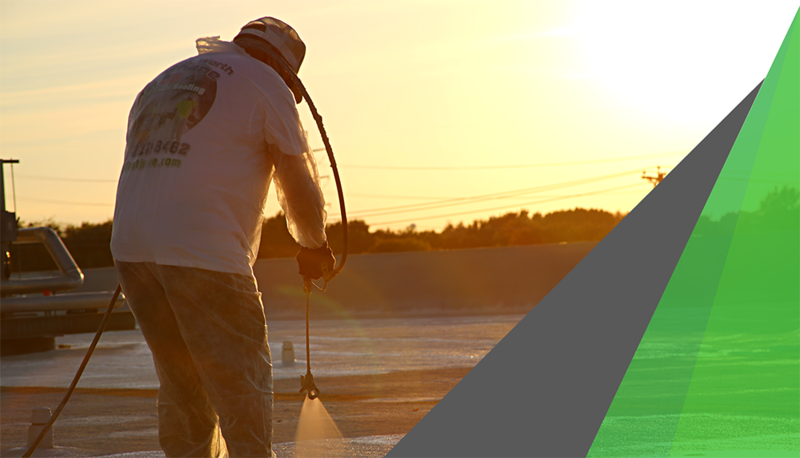 We have a suite of coatings that we can apply to your roof to reflect the intense heat of the sun. Combine this with a material (spray polyurethane foam) that just doesn’t get as hot as traditional materials, and the exterior of your building is kept much cooler. Which means cooling the interior of your building costs less. Depending on the system you choose, not only do you eliminate seams and gaps in your roof and keep cool air from escaping or hot air from entering, but you also reduce the exterior temperature of the building, reducing the internal cooling cost. Many people aren’t aware that SPF is even an option for their roof, or that spray polyurethane foam on the exterior of their roof can protect their building from heating up. They’re focused on applying insulation inside their building. But an SPF roof provides a more efficient, more effective, and longer-lasting solution not only to your insulation problems, but also to any future roofing issues, like leaks from storm damage. However, to fully insulate your building, weatherization is necessary. Learn more about the weatherization process and how we insulate your building against air leaks.